Why should I buy energy saving light bulbs? How long do energy saving bulbs last? Will a energy saving light bulb work in my regular socket? Aren't fluorescent lights always harsh, more glaring? Don't energy saving light bulbs flicker when you turn them on? Why are the wattage numbers on energy saving light bulbs different from regular bulbs? What wattages are available in energy saving bulbs? What effect will using energy saving light bulbs have on our environment? Where can I use energy saving light bulbs? Can the energy saving light bulb be dimmed? Can energy saving light bulb be operated with direct voltage? Does a frequent turning on of energy saving light bulb lead to a shortened life? Is a substitution for energy saving bulb on the staircase possible and sensible? Does a energy saving bulb consume more electricity when switched on than when in permanent operation? Why does energy saving light bulb 20W appear much darker than a light bulb of 100W? Is the mercury in the energy saving bulb ecologically reasonable? Do energy saving light bulb contain radioactive constituents? Is there a broadcast reception interference if energy saving light bulb are used? What's energy saving light bulb? Energy saving bulb ( also called compact fluorescent bulb, energy saving lamp, compact fluorescent light bulb and compact fluorescent lamp) generates their light on the same principle as fluorescent lamps. An electrical charge is passed through mercury vapour between two electrodes. This electrical field causes the vapour to emit invisible UV radiation. Fluorescent material applied to the inside of the glass tube converts the UV radiation into visible light. Different fluorescent materials give the light different colour appearances. By giving the lamps more than one tube and bending each tube back on itself, lamp designers have managed to reduce the overall length of energy saving light bulbs. They are now not much bigger than ordinary light bulbs. Why should I buy energy saving bulbs? Because they will save you money on your electric bill and they last longer than standard bulbs. They virtually pay for themselves! The energy saving light bulbs that replaces your old 75 watt incandescent bulb will save you $44.00 (on average) in energy costs. * Over the life of the energy saving light bulb, that's a 70%-75% savings vs. incandescents. Multiply that by the number of lamps in your home - and you've saved a lot. *At $0.08 per kWH, national average energy rate, over life of energy saving light bulb. How long do energy saving light bulbs last? Energy saving light bulbs last at least 5,000 hours - that's five times longer than your old bulbs! If you used a lamp in the evening from 5 p.m. until 11 p.m. - every day of the year - the lamp would produce beautiful, warm light for more than four and one-half years! Will a energy saving bulb work in my regular socket? Yes. . . energy saving light bulbs fit perfectly in your standard incandescent sockets. No. . energy saving light bulbs have been designed to produce warm, pleasing light. You'll find it similar to our soft white bulbs. No. . . Special technology eliminates this problem. Why are the wattage numbers on energy saving bulbs different from regular bulbs? Energy saving light bulb numbers are lower because the bulbs use less electricity. The technology makes the ultimate use of every watt. Although a energy saving light bulb burns about as brightly as an incandescent, it uses much less power, saving you money, and thus has a lower wattage rating. What wattages are available in energy saving light bulbs? Energy saving light bulbs are available to replace 25-, 40-, 60-, 75-, 100-, and 150-watt incandescents. For example, a 15-watt compact fluorescent can replace a 75-watts incandescent bulb. *Fluorescent light output that is equal to the incandescent it replaces. Fluorescent lamp lumens decline during its longer life. What effect will using energy saving bulbs have on our environment? If high efficiency lighting products were used by everyone, we could reduce the amount of electricity needed for lighting by 50%. *Also, recycling efforts would be helped since there would be five times less old bulbs to throw out. Energy saving light bulbs are great for table lamps, downlighting, wall sconces, corridor lighting and enclosed outdoor fixtures. Can the energy saving bulb be dimmed? A brightness control is not permissable and also not possible. The electronic pre-switch system of the lamp contains a rectifier with a post-switch smoothing condensor (Elko). The Elko is always charged to the highest value of the alternating current, the mains current flowing quickly towards and as far as the maximum mains voltage. This configuration prohibits the operation of dimmers available in the trade as phase on and off dimmers damage the Elko due to their steep voltage gradient. Most dimmers need a minimal load many times so that - even with a fully turned-on dimmer - its switching element does not find sufficient stopping power and therefore it switches on and off constantly. This damages energy saving light bulb until it is destroyed and also endangers the dimmer. Usually, 5W to 11W E27 and 5W to 7W E14 can be operated on a direct voltage between 176V to 340V besides the usual alternating power usage. This means, for instance, energy saving light bulb may be operated with battery supplied 220/230V facilities in internal areas. At the lower limit of 176V the lamps will light perfectly in a environment with a temperature of 5°C to 50°C. They are not sensitive to over-voltages of the direct current grid up to 340V. energy saving light bulb attains its relevant nominal data with direct voltage operation of 310V. The following typical deviations occur with other direct voltage values. Sometime, 7W to 11W are also in principal suitable for emergency lighting facilities. Does a frequent turning on of energy saving bulb lead to a shortened life? A shortened life with frequent turning on of energy saving light bulbs only applies to the operation on conventional pre-switch systems. LONGLIFE energy saving light bulb have in their base E27 an integrated EVG. Due to the optimally adjusted electronics with a precisely defined warm start, the LONGLIFE energy saving light bulb can be started especially gently. In this way they can be turned on just as frequently as light bulbs, provided that, before they are turned on again, there is an interval of 2 Minutes adhered to for the cold conductor to cool down. LONGLIFE energy saving light bulb attained even more than 500,000 switch ons when tested. These lamps can be used everywhere in the household without suffering a reduction in the life. Is a substitution of lamps for energy saving light bulb on the staircase possible and sensible? A substitution for energy saving light bulbs is only sensible if the the switch intervals are not too short. It takes, after all, ca. 2 minutes at room temperatue until a DULUX has attained its full lighting output = brightness and therefore a turning off should not take place before the passing of this time period. A noteworthy shortening of the life span only occurs if the switch off time is less than 2 minutes, which with staircase illumination happens especially frequently in the early hours of 7.00 hrs and 9.00 hrs in the morning and with automatic timeswitches as well. In such a case, one should switch over to permanent operation during this time period so that no shortening of life span is experienced. Does an energy saving bulb consume more electricity when switched on than when in permanent operation? The power consumption when turning on a energy saving light bulb is not higher than that during permanent operation. When turning on, there is a higher current flow in- similar to light bulbs - but this is only for the duration of ca. 170ms and is not registered by the electricity meter. A frequent turning on, therefore, has no negative influence on the power consumption. Why does energy saving light bulb 20W appear much darker than a light bulb of 100W ? Energy saving light bulb 20W is 1200lm, and the light power of a 100W bulb is 1380 lm. From it you can see that the energy saving light bulb 20W with in light power would be approximately equivalent to a "87W light bulb". 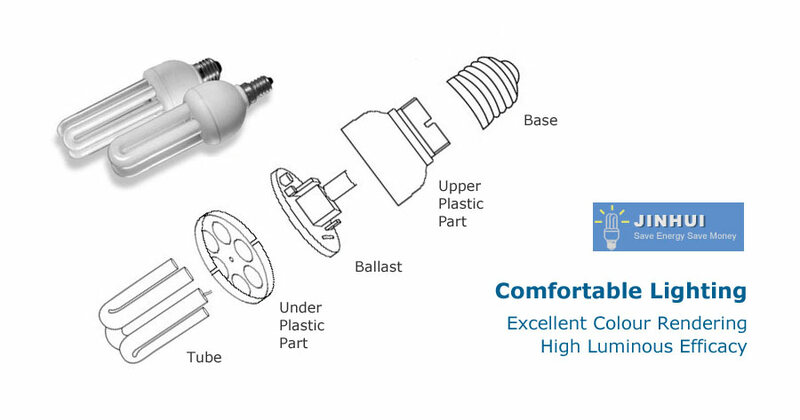 As bulbs of this performance level are not available on the market, it was decided to select for the pictogram on the outer packaging the nearest possible comparable output level in light power of conventional bulbs. This enables the customer to assess this product. It is to be observed that energy saving light bulbs will require 2 minutes burn-in time after having been turned on until the full light power is attained. Upon turning on, the light power amounts to approximately 40%. It must also be taken into consideration that the energy saving light bulb is a compact fluorescent lamp which has totally different deflection properties (i.e., distribution of light strength and light colour) if compared to a light bulb. You may, of course, if you wish to receive more light, go to the next highest output level ( 23W) without any problems and you will still save a great amount of energy and money even with a higher lighting strength. The fluorescent lamp like all traditional fluorescent lamps contains low levels of mercury. Compact fluorescent lamps with integrated electronic pre-switch systems do not contain radioactive constituents. (such as, for example, Krypton 85), also do not contain radioactive substances. This also applies to the appropriate electronic pre-switch system. Is there a broadcast reception interference if energy saving bulb are used? These lamps are discharge lamps with an electronic pre-switch system which operates with an operating frequency between 30 und 45 kHz depending on type of lamp. With it also higher frequency upper wave lengths are produced that are being dampened by transmitter non-interference filters so that the issued legally prescribed border values and cable associated interferences are in no way exceeded. These prescriptions are laid down in DIN VDE 0875 Part 2 resp. CISPR 15. The low residual transmission can, however, bring about interferences, if the reception aerial is in the proximity of the lamp (for example, with a distance of less than 1 to 3 metres for long wave). Similar interferences will occur, for example, with computers and other gadgets used in households and offices that have switching components. If cable associated interferences prove to be incompatible with neighbouring gadgets, then this must be blamed on the insufficient filter expenditure for the de-coupling of mains interferences via the broadcasting receiver and is not due to energy saving light bulb, as lamps as already mentioned, comply with the regulation for broadcasting interference and interference protection and, therefore, carry the CE labelling of the European Union. Energy saving light bulbs are perfect for hard-to-reach places where changing a bulb is difficult. They fit most fixtures around your house but are not designed for fixtures with dimmers, photocells or those with shades that clip onto the bulb.